At the moment the EuroCup Women competition is looking good for the two clubs playing in the Ligue Féminine de Basketball. Lattes Montpellier and USO Mondeville remain unbeaten and have already secured a place in the sixteenth-final (play-offs). Montpellier beat CAD Madeira from Portugal (82-60) with 18 points coming from Khadijah Whittington. USO Mondeville did not have to work too hard in overcoming another Vagos also from Portugal (86-52). Valeriya Berezhynska compiled a double-double of 20 points and 12 rebounds for Mondeville. Sheana Mosch (above) made her first appearance in this competition this season for Russian club side Nadezhda. 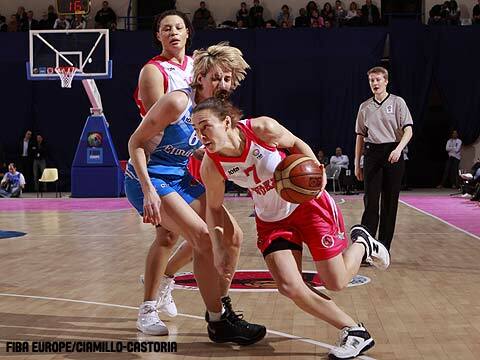 Her side was beaten (87-80) by Botas Spor from Turkey to suffer its first defeat. Botos Spor went 13-of-27 from beyond the arc and had five players in double digits. Sharnee Zoll was the player of the match with 18 points, 10 assists and 5 rebounds for Botos Spor. Besiktas JK also from Turkey beat Russian club side Chevakata (81-80). The Russian side are yet to win in a match and will be eliminated if they lose next week. The Saarlouis Royals made up for their round one loss to Ibiza Sport Island by beating them (83-75). The match was screened live on the club's website. German international Romy Bär, Brittany Wilkins and Czech Republic international, Petra Manáková, all scored 16 points for the Royals. Shannon Johnson fired in 26 points for the visitors before she fouled out. Krissy Bade did not score during her 19 minutes on court. CCC Polkowice, Dynamo Moscow and Gran Canaria remain unbeaten and officially join Mondeville, Montpellier, Spartak Noginsk and KK Hemofarm Stada in the sixth-final. Other teams to qualify are: Sony Athinaikos, Besiktas JK, Seat Györ and MKB Ruzomberok.